It gives me pleasure to announce the publication of this book "THE ARANYAKA-S (A CRITICAL STUDY)" by Dr. Indu Deshpande. Dr. Indu Deshpande has dedicated her work to her guide the Late Dr. R. N. Dandekar. Dr. R. N. Dandekar has substantially contributed towards the development of the Vaidika Samshodhana Mandala (Adarsha Sanskrit Shodha Samstha). We sincerely thank Dr. Indu Deshpande for allowing us to publish her work which was completed under the supervision of Dr. R. N. Dandekar. This year being the birth—centena1y year of Dr. R. N. Dandekar, we pay our homage by publishing this work. We are really thankful to following institutions and persons for extending their help in bringing out this work. Dr. Saroja Bhate for sparing time to write a foreword for this book. The Rashtriya Sanskrit Samsthan, New Delhi for substantially funding for the publication of this work. The authorities of the University of Pune, for granting the permission for publication of this work. Mr. Sudhakar Sathe and Mr. Mukund Dongre for the donations. Mr. Mukund Dongre donated in memory of his wife Mrs. Vidya Dongre, former librarian of Vaidika Samshodhana Mandala. We could not but express our humble gratitude towards H.H. Shri S.A.R.P.V. Chaturvedi Swami of Sri Ramanuja Mission Trust, Chennai for sponsoring the paper for the printing of this book. We accept it as the blessings from Swamiji. Ms. Ketaki Gokhale for carefully and perfectly doing the computerized type setting of this work. Ms. Vaijanti Dhole-Patil and Ms. Surekha Wagle of Step in Services, Pune for printing the work in time. 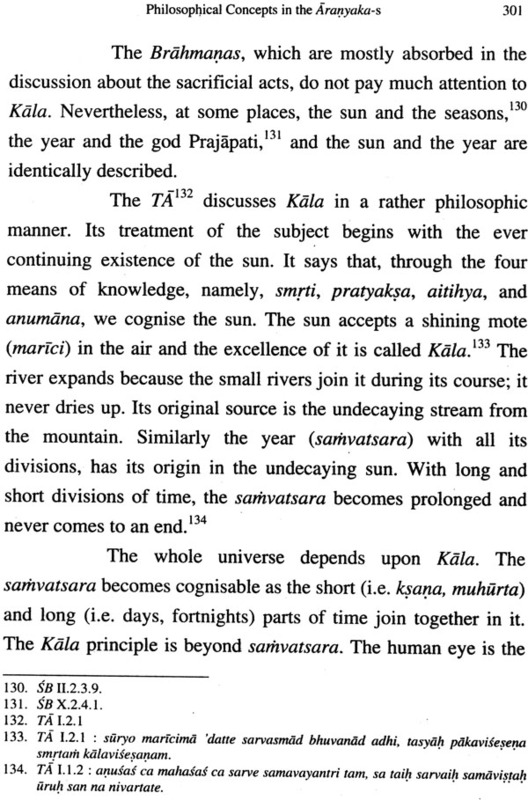 The Vedic literature owes its importance to the fact that it represents, as a whole, one of the oldest documents of the history of human civilization. The significant role played by the Vedas on the one Land and the Upanisads on the other in providing fundamental source material to trace the development of key-concepts of Indian scientific thought has been, time and again, emphasized by historians of philosophy. 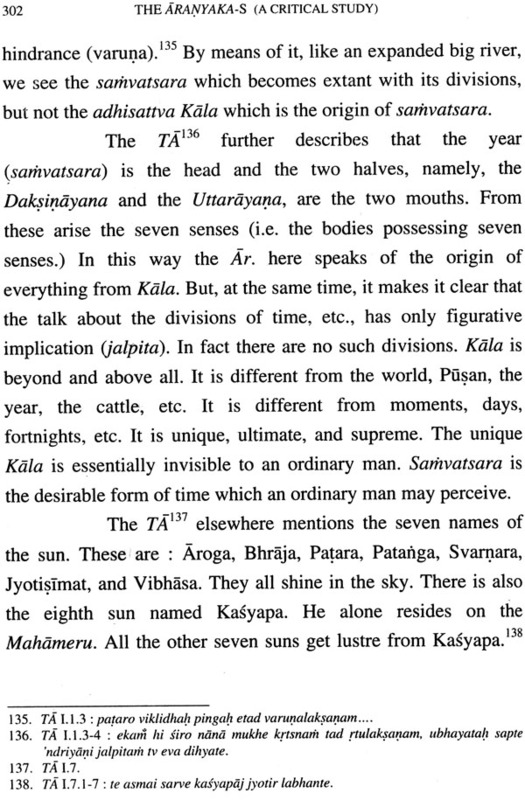 The Aranyaka-s has been, however, relegated to insignificance, perhaps because of their finite quantity and their nature as appendices to the Brahmana texts. Their importance of valuable documents of history of development of scientific thought in India is not less than other texts. It is, therefore, qualifying to see a book totally devoted to the study of Aranyaka-s in all aspects. Dr. Indu Deshpande, the author, deserves special compliments for focusing on this neglected part of Vedic literature and bringing to light, perhaps for the first time, hidden pearls of thought linking ritualism with spiritualism. The book presents a compact study of all Aranyaka-s with reference to their conducts, namely, rituals, philosophy, legends and mythology and finally, social life reflected in them. 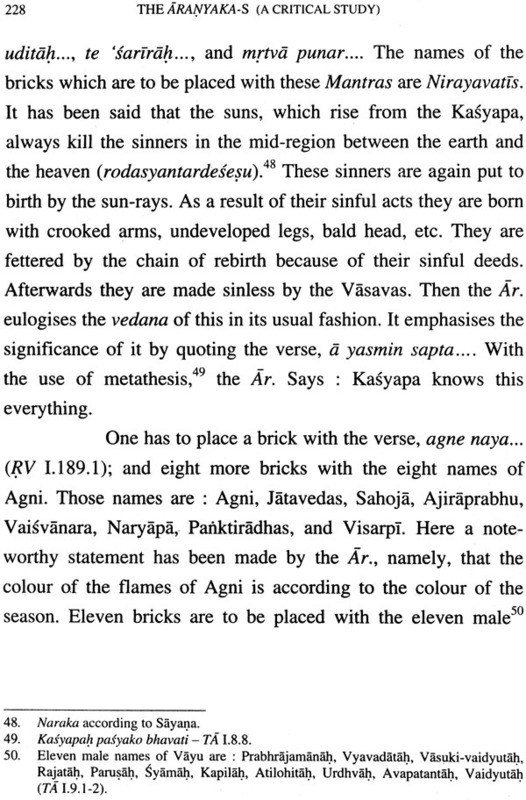 One gets a clear idea after reading the book that the 1-irapyaka-s hold themselves closure to the Upanisads which follow them, though they appear as appendages to the Brahmanas. 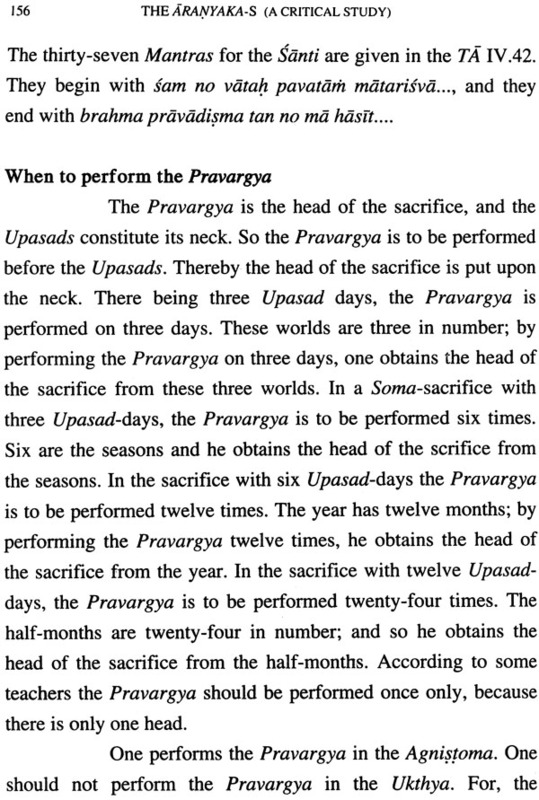 They do carry forward the Brahmanic mission of explaining the ritual of sacrifices. 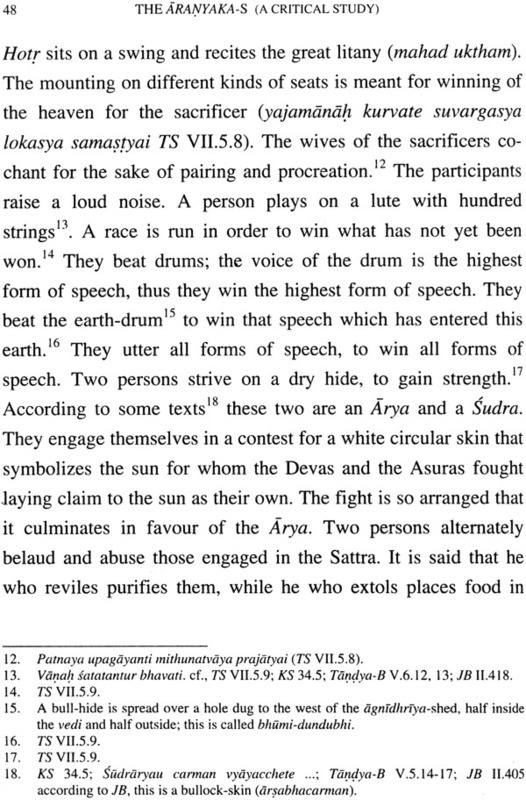 However the seers of the Aranyaka-s are seen often engaged in stressing the efficacy of inner and mental sacrifice. The thought process of these seers is directed towards spiritualism away from materialism. 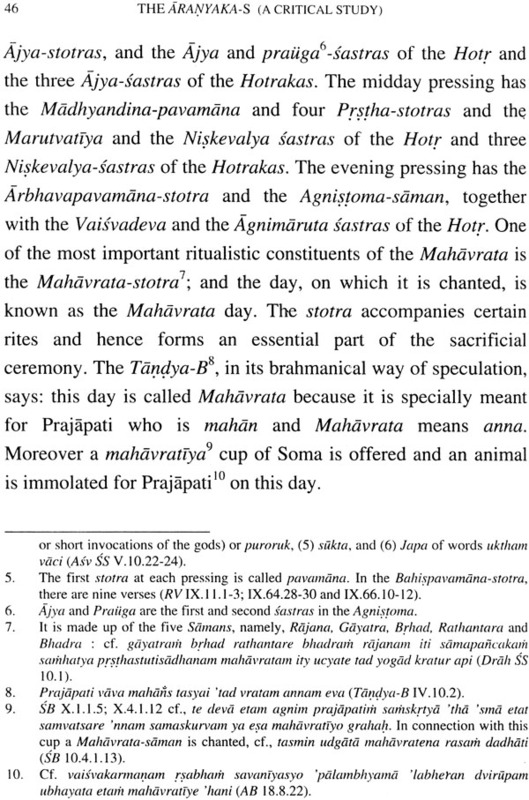 The book contains many references to the texts of the Aranyaka-s where symbolic sacrifice is advocated. At one place, all activities of everyday life of a human being are compared to different parts of sacrifice and thereby the message is conveyed that leading a life of good conduct based on values itself is a sacrifice. 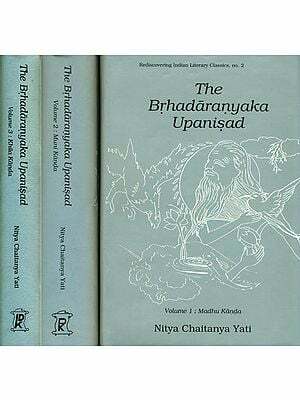 These texts bear witness to the sublime heights of meditation on human life by the composers of these texts much before the Upanisadic thinkers soared into the realm of identity between Brahman and Atman. These texts also mark a perfect blend of jnana and karman, the two ways to reach the highest reality. 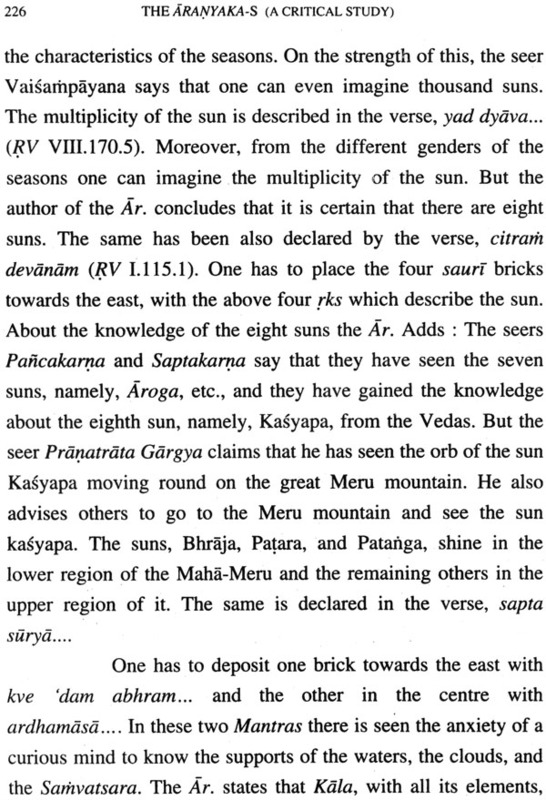 Another interesting fact about the Aranyaka-s revealed to us in this book is that they sponsor Sun-worship, perhaps for the first time. The author has established it with ample evidence. 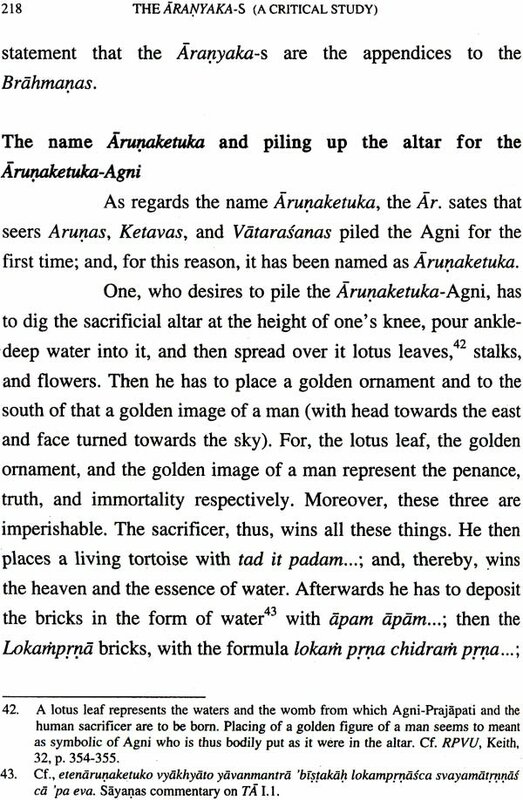 The texts of the Aranyaka-s thus provide enough material to trace the development of mysticism and symbolism through the process of "inwardisation". I strongly believe that the book provides valuable study material on i¢Iraq1yaka—s and hints at direction for further research in Vedic studies. Once again I congratulate the author for her seminal contribution. An attempt is made in this book to present a more or less complete analytical and critical study of the four Aranyaka-s, namely, the AA the SanA the TA, and the Brhadaranyaka. As will be pointed out in the sequel, a lot of valuable work has already been done on the Aranyaka-s, but a comprehensive study of the Aranyaka-s as a whole was still wanting. 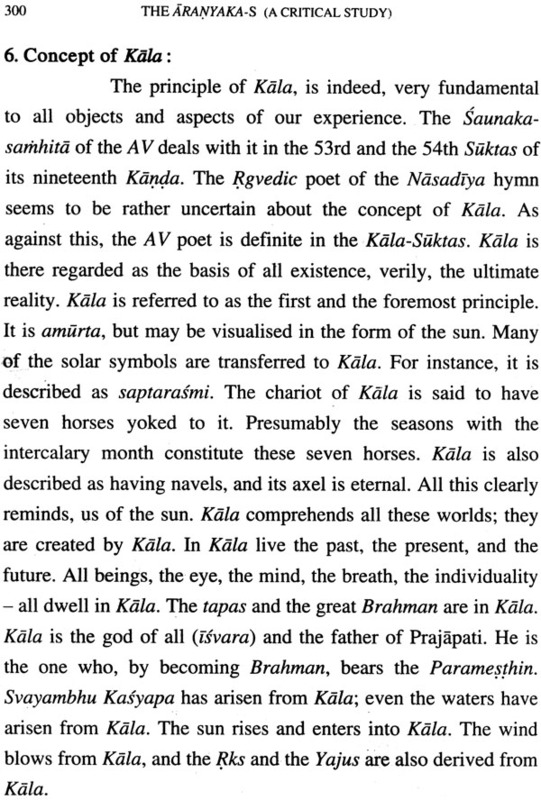 It is hoped that the present book will till in, at least to some extent, the lacuna pertaining to this important branch of Vedic literature. 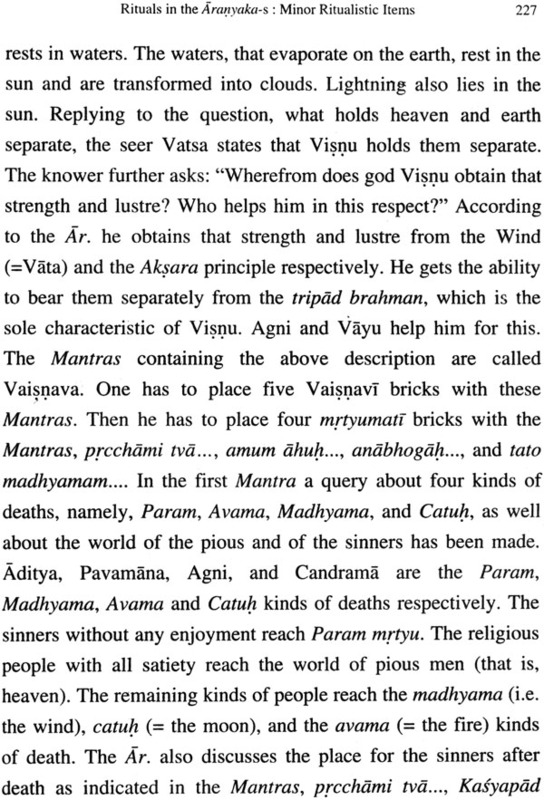 By way of an introduction to the central theme of the book, the first chapter begins by presenting a brief survey of the Vedic literature and then goes on to deal with such topics as the place of the Aranyaka-s in the Vedic literature and the importance of the study of the Aranyaka-s. 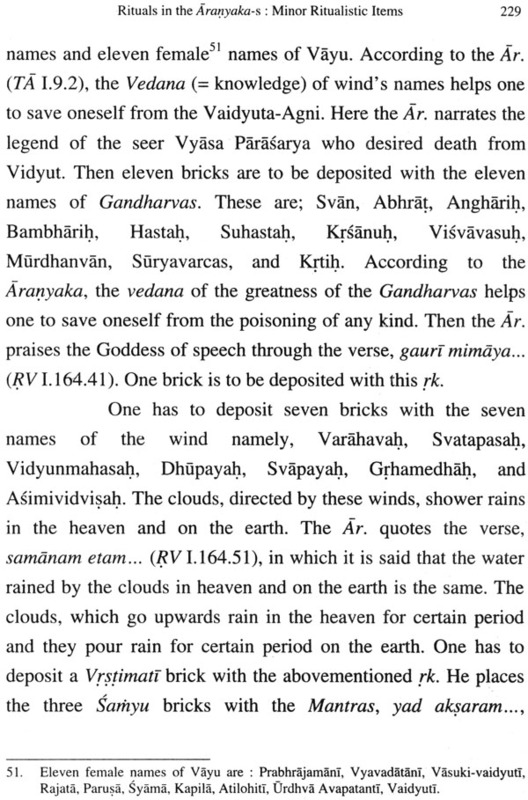 This is followed by a detailed note on the Aranyaka-s, which includes a discussion about the name " Aranyaka", the Ar. 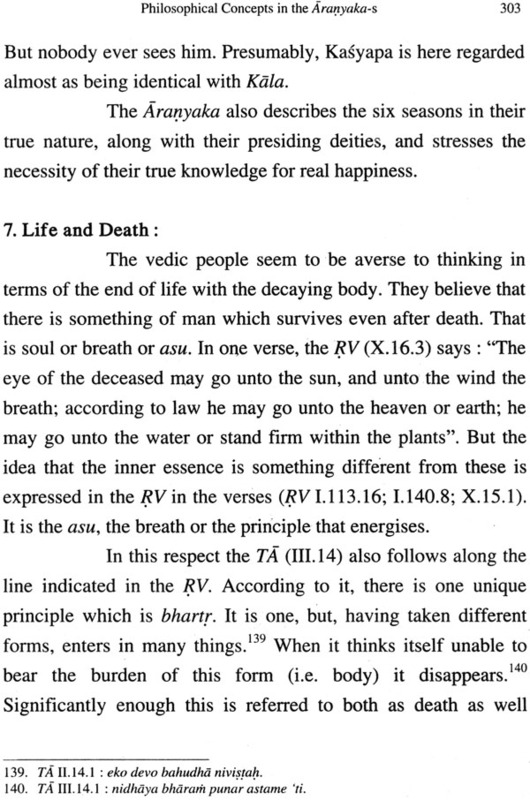 texts which are known and which are available, the Vedic schools, the Asramas, and similar other subjects. It also includes a broad analysis of the contents of the Ar. texts. 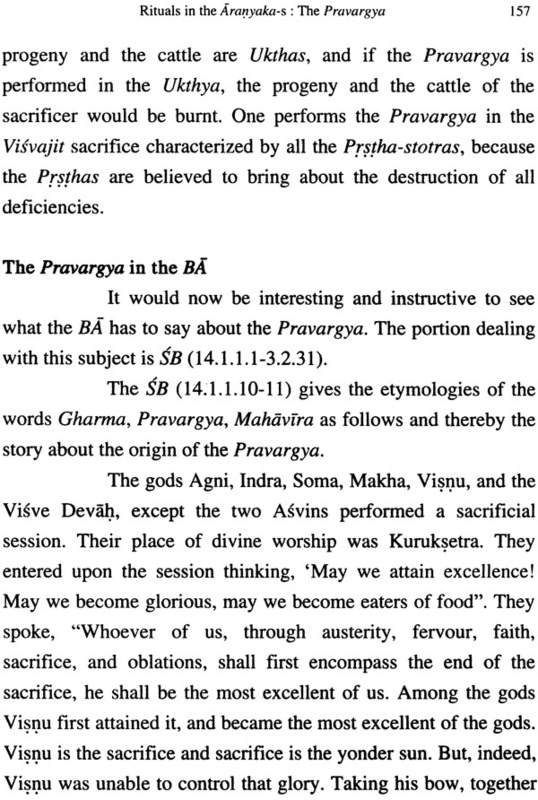 The Introductory chapter concludes with a note on the work already done on the Aranyaka-s. 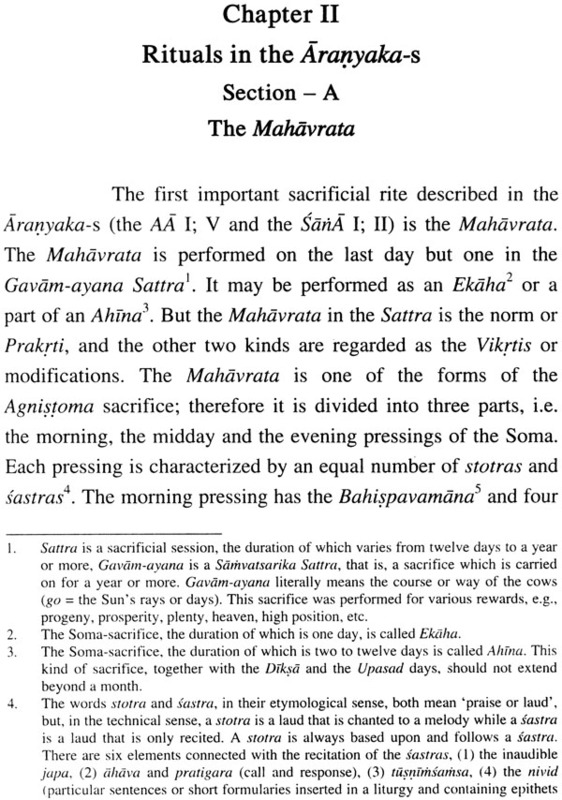 The second chapter of the thesis is devoted t to the description of the ritual as it occurs in the Aranyaka-s. While emphasis is naturally put on the two main aspects of the Ar. 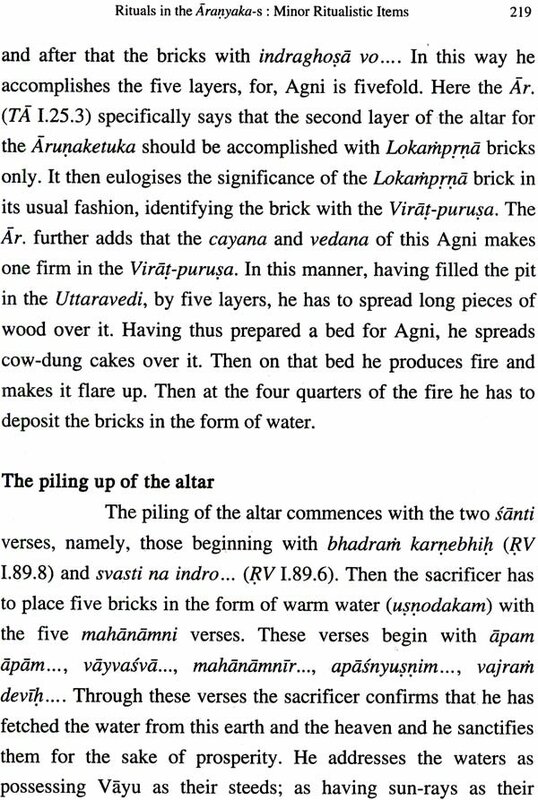 ritual, namely, the Mahavrata and the Pravargya, the minor rituals like the Arunaketuka-cayana, the Kusmanda-homa, the Brahmayajna, etc, are also treated in some detail with a view to finding out whether the ritual of the Ar. 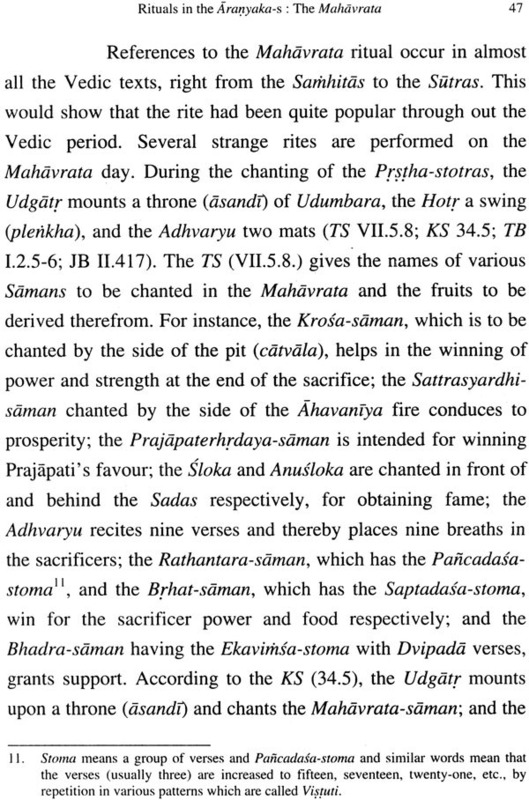 differs in any significant way from the ritual of the Brahmanas. 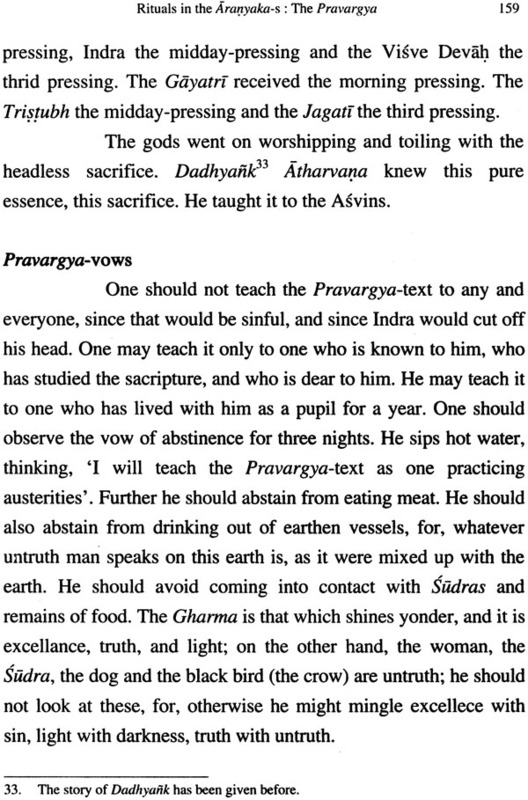 The Aranyaka-s are often represented as marking the transition between the mechanical sacerdotalism of the Brahmanas and the esoteric spiritualism of the Upanisads. Whether or not this is so can be ascertained by a critical study of the philosophical concepts in the Aranyaka-s. This is what is attempted in the third chapter. The fourth chapter occupies itself with the legends and mythology of the Aranyaka-s, while the fifth and concluding chapter briefly sets forth the general cultural and socio-historical back ground of the Aranyaka-s.